CRM technology will continue to grow and evolve in the years to come. 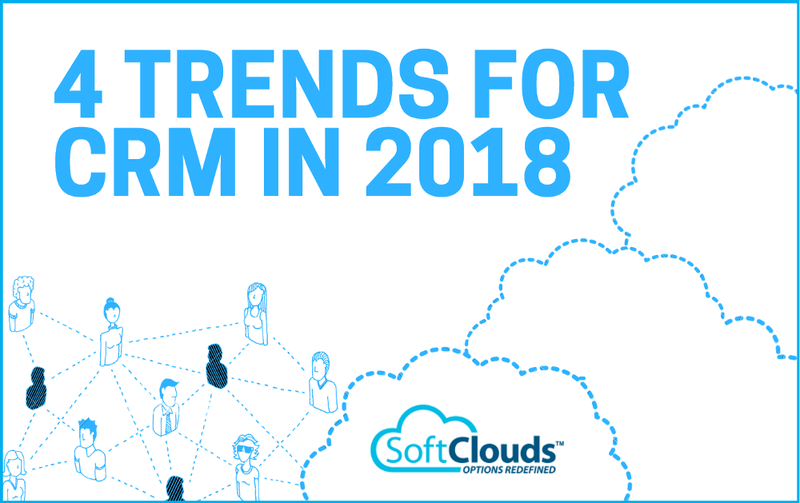 Lets see what the CRM trends in 2018 will be. In the late '80s companies used front-office applications, like contact management software, which stored and organized customers' contact information. It wasn't until the '90s, when technology focused on automating business processes, that we began to see the potential of Customer Relationship Management (CRM) software. It was during this time that collaboration between organizations began to take place and when CRM first became mobile. By the 2000's, CRM systems evolved to become a tool that managed all business relationships and analyzed customer interactions and data throughout the customer life-cycle. It was also a time when cloud-based CRM got introduced. Where is CRM heading in 2018? 1. Personalized Workflow Automation through Artificial Intelligence (AI) technology platforms. Artificial Intelligence technology will undoubtedly be the most prominent advances for CRM in 2018. AI has the potential to make every business smarter. AI will power up our CRM systems to learn from our interactions through data, help us find answers to our questions, predict our needs, and it will take care of tedious and forgotten tasks so we can focus the important ones. By doing this, AI will reduce manual work to the minimum, create automatic actions and reconfigure interfaces to better suit our usage patterns and save us hours of work. With AI-powered CRM systems, companies can access unseen and untapped operational and system activity patterns, and uncover insights to deliver significant benefits. For example, CRM systems coupled with AI will learn from repeated usage patterns of marketers and salespeople. Based on that, it can automate their tasks on a daily basis. Furthermore, AI can collect information on a lead or an existing customer, analyze the data, predict trends, and make critical decisions which will reduce the number of cold calls for sales departments. 2. 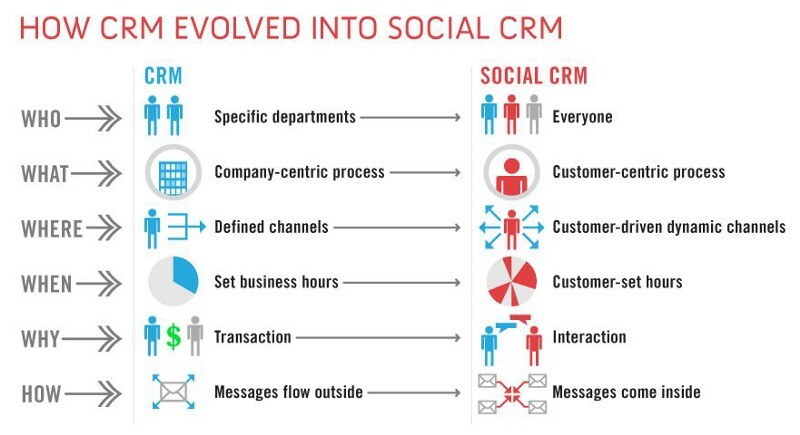 From Social Media to Social CRM. Social CRM is the next frontier in customer relationship management, for companies who want to optimize the power of social networks, so they can get closer to their customers. Many businesses have enthusiastically embraced social media and started creating virtual communities. Interactions through service bots in social networking sites will keep customers engaged with brands and companies since they can influence a company's image and perception. Social CRM will not only engage and interact with existing and potential customers, but also give organizations access to information about customer behavior and opinions. This aids in quickly resolving issues (e.g. with mobile devices) and may be done anytime, anywhere. An example of Social CRM is Comcast Cares, Comcast's customer service via Twitter. If done right, Social CRM may undoubtedly enhance an organization's Social media connections, and may allow businesses to better anticipate and respond to customers' needs; as well as monitor, track, and manage conversations. This is regardless of Comcast's problem in that their customer service is already widely unpopular, despite repeated executive promises and detailed improvement plans. Another trend for CRM in 2018 will be to improve the usage of CRM systems through tighter integration with external tools and services. CRM developers will need to find a way to integrate new services and technologies across sales, marketing, and customer support applications. There is a need for industry-standard interfaces to connect to multiple solutions and services. For example, REST based APIs are the key to successful collaboration by allowing systems to easily communicate with one another securely and privately. According to CEO of online lawn care provider GreenPal, Bryan Clayton, most major CRMs have integration today but they have a long way to go to allow for intelligent synchronization across platforms. Mobile and web-based solutions need to be integrated with a CRM for enhanced productivity. For example, external tools in the form of apps may be used to enhance user productivity and help users to easily and seamlessly perform work. According to Gartner, businesses who fail to implement the right data management and customer interaction strategy will lose out on a 25% increase in potential new revenue. Companies around the world are striving to design and implement optimal CRM-based campaigns and programs, aiming to reach and engage their audience across channels and devices. Personalization will continue to drive the individual customer experience. CRM will still be critical in reaching customers through messaging. This means reaching the right audience exactly where and when they need to receive the message. Tools like automated AI analysis, which will "know" when and to whom those messages got sent to, will make this possible. Bots on Facebook Messenger, for example, are already able to determine user demographics and other valuable user information. As a result, organizations can identify potential market segments, and track traffic and sales patterns to personalize messages to customers based on this information. To quote digital marketing manager for Sparxoo, Erika Levy, "What's exciting is the ability to use CRM data to get the right messages to audiences at the right time." To conclude, companies will need to recognize how to harness CRM to build and keep customer relationships. With the advent of AI, Machine Learning, and Big Data; CRM will be able to utilize the vast amounts of data available to it. Moreover, organizations can no longer deny the power of social media, and social CRM will help companies gain an insight into customers' opinions as well as aid in interacting with those customers. Staying on top of the changes and trends in CRM means: having the ability to evaluate trends and making better predictions and decisions. Integration, personalization, and identifying attention-grabbing information will help organizations deal with customers in the best way possible. We've come a long way from CRM's early beginnings, yet it's still not a perfect tool. One of the challenges facing the CRM industry is how companies can best integrate CRM into their system. 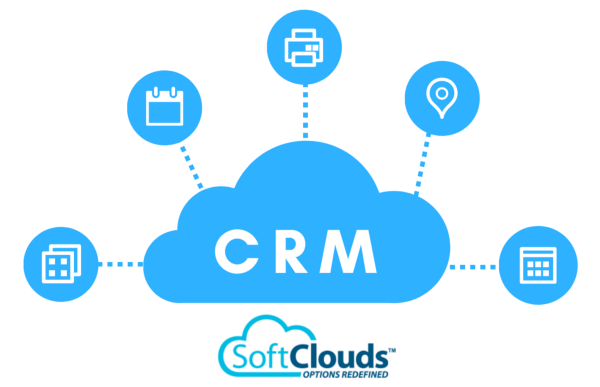 However, CRM solutions continue to incorporate more features like customer service, and social CRM and are becoming cloud-based, integrating with mobile devices. CRM technology will continue to grow and evolve in the years to come, and organizations must actively participate in its adoption and development. This post was written by Balaji Ramachandran, Founder & CEO of SoftClouds. He has over two decades of experience in Technology, Business Development and Operations and a very strong foundation in Customer Relationship Management for SMB and Enterprise. Utilizing his profound expertise, he has spoken at conferences around CRM & Technology around the world. If you have any questions, or would like to find out more about SoftClouds and our extensive experience, you can reach us at "marketing-at-softclouds-dot-com".